Today, Sega has revealed the box art for the upcoming Aliens: Colonial Marines game. You can find high-res shots of the artwork on PC, Xbox 360 and PC as well as the full press release by clicking the image below. Check out all the versions here. Also be sure to let us know your thoughts on the artwork in our forums. In related news, Gearbox Software CEO Randy Pitchford has talked about the game’s delay & Prometheus during a recent interview with Playstation. You can read the full thing here. Thanks to Sega for the news. Today we are excited to reveal the pack fronts for SEGA’s highly anticipated Aliens: Colonial Marines™, featuring you and your friends as the ultimate badasses against the deadliest killers in the galaxy. 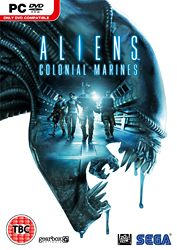 In partnership with Twentieth Century Fox Consumer Products and developed by critically acclaimed studio Gearbox Software, Aliens: Colonial Marines will bring new levels of bone-chilling suspense and adrenaline-filled action to the renowned franchise. The game pits players against the universe’s ultimate alien killing machines, the Xenomorphs, in claustrophobic environments guaranteed to produce blood curdling thrills that the movie is renowned for. Aliens: Colonial Marines begins with an ostensibly abandoned ship, the U.S.S. Sulaco, recovered in orbit around LV-426. Players lead a group of highly trained United States Colonial Marines as they board the deserted craft to uncover the fate of the crew. They will have to fight to survive unspeakable horrors and their own anxieties as they chase down the truth behind a galaxy-spanning deception that places humanity at the mercy of the most murderous and deadly species in the universe. Aliens: Colonial Marines features authentic environments, such as the surface of LV-426 and Hadley’s Hope, weapons inspired by the film series and is designed to provide an exhilarating and engaging new chapter in the Aliens universe. The characters on the cover are ridiculous. Randy, among others who have tried to portray the colonial marines after Cameron always seem to get the whole thing wrong. I see Aliens as cyberpunk, with punk characters. Cigarrette between the teeth they fix a sentry gun. They look marines but upon closer inspection they are not, it's just a way to put butter on the bread. The identity of the characters isn't stereotypically tied to their employer. So my point is that Randy among many have the same interpretation of the marines we all already know, but it's wrong and shallow. Cameron loves cyberpunk, u can see the load and trouble his characters carry on their soldiers, under their uniforms. Its a tough world, corrupted society. They're punks. even in MP having those squad names would be doofy Like a Mad Magazine spoof. Maybe they'll have obvious "not so obvious" playable characters in some sort of side story mode that are similar like "Ricks", "Huston", "Ramirez", "Blake", "Gordon", "Verro" and "Helen Risley" with some evil dork named "Connor Lurke"? hahaha... that would be sweet! unless they were only for multiplayer. Good use of white space in my opinion. Brings forward the extra details of the xeno's head. I also think the head stands out a little more on white than it would on a black back ground. I completely agree. After experimenting with making the background black myself, I came to the same conclusion. The profile of the alien is harder to make out on a black background, and the focal point of the marines in the middle is lost. I still say the blank canvas with nothing but the words "Aliens Colonial Marines" written in the graphic style of the of film idea would suffice. Your signature pic is perfect, just squeeze the letters so they're more narrow and fill the cover with blackness. The back side could have anything on it for all I care. It would look nice with the Alien Anthology, I think. Though the collector's edition could have a completely different cover. The AvP 2010 cover was much better, and what's with the white background, looks likes it's been given as much thought as the games release date, average at best but just doesn't give that ALIENS vibe at all. Only just seen this! I love! Black on white is better IMO I give it good but not fantastic. I think it is an average at best, cover. The colors remind me of the scene in alien 3... where ripley is pinned against the wall and the dog alien menaces her. Or maybe the AVP movie poster. Personally, I could see some box art being the steel grating in the hallways of the colony, acid stained, with an empty pulse rifle nearby and a left 4 dead style hand. So whos is the Mod who is constantly deleting my posts,you have done it in this thread and i want to know why. We checked and none has deleted any of your posts. If you're having technical difficulties with the forum please message one of the Admins. Don't care, I'm buying the game to play it, not look at the cover. only kidding, who cares about post count anyway, if someone has an opinion, but it appears someone else has already stated a similar statement and they wish to express their opinion too, what's wrong with stating their agreement? Looks alright I just hope the game is good. I like the box art, the white will definitely make it stand out next to other games. I would have preferred to see the marines inside the silhouette of the crusher alien instead of a regular xenomorph. Lame. I personally like the box art a lot. I like the feel of the art that it has. Yeah same, what will sell me on this game is obviously how good it is, not the box art. It looks better in any case, as with the white background! I hope the Collector's Edition version of this game will have a different looking cover, like AVP2010 did; in my opinion, the cover of this game needs more originality. Anybody else notice that the Marine on the left has a robotic leg? Cruz, Bella, Winter, and O'Neal. Cruz is in the Walkthrough footage. i notice one of the 4 marines is a girl, is that first confirmation of female marines? I'd certainly expect to be able to play as one if there's one on the cover, and i know a lot of people were hoping to be able to do that. the zoomed in version on the console box is a lot better. with less white. We've known about Bella for a while now and also there are female marines in the cinematic trailer. I'm kind of on the fence about this cover. While I'm glad they went for something different the overall design feels very bland to me. There's no sense of tension or threat or dread. The marines in the cover are just walking down the hall with very neutral expressions and relaxed poses. Also blue and white are very calming colors. The composition feels very uneven (too heavy on the left) and the monochromatic color scheme is making some of the details vanish (as seen with the weapons). There's also some weird perspective stuff going on with the inner jaw and the rest of the mouth. I actually preferred some of Xeno_kilelrs mock ups. Then again this is just very nitpicky stuff. I really love it. The alien head is striking and the cover makes excellent use of negative space. And thehut.com says it will be released on October 18th. Yeah, kinda lazy IMHO. Just the same Aliens graphic from the AvP CE edition. Good enough looking image but lazy none-the-less. Like the white though. Different style. I love it !!! couldent ask for more!. Pretty good. Has that nice blue tint from the film. I think its pretty cool. I'd say its on par with aliens vs predator 2010s CE box art. I'd say it's exactly the same. I don't mind it but the only thing is why does the guy in the middle have goggles on his helmet? does this represent some level of customization? I'm not especially fond of this cover (it looks too much like the AVP2010 Hunter Edition cover), but I guess I could get used to it.